Koi ponds are a thing of beauty. They are elegant and breath taking. There is nothing better than watching a swarm of koi in a feeding frenzy, or watching a large fish maneuver its way slowly through sparkling pond water. Many people get caught up in the idea of creating a koi pond, but never really spend the time finding out what it takes to make their pond successful. The result: a huge gaping hole in their backyard, and a maxed out credit card. Below you will find the Do’s and Don’ts of designing a koi pond. R Don’t let anyone tell you that any old pond design will do! 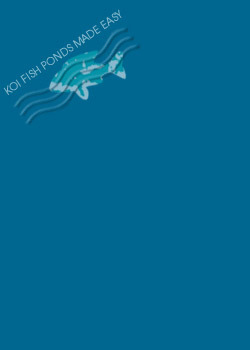 Koi require specialized equipment and design features. If you try to raise koi in a standard garden pond, they will likely fail to thrive and result in a huge, stinky, mess. R Do take into account size matters. If you make your pond too small, you can actually stunt the growth of your koi. When designing your pond, you want to make it at least 6 feet deep at its deepest, with various slopes and shelves. Also think about the shape of your pond - you want something that is pleasing to the eye and functional for your fish. cause an overgrowth of algae. life of your pond, while others will cause you nothing but heartache. shopping, and go with someone you trust. R Do enjoy your beautiful koi pond when it is finished!